Norwalk Public Schools Chief Financial Officer Thomas Hamilton, right, helps Norwalk Director of Management and Budgets Angela Fogel, left, present the recommended 2019-20 operating budget, Monday in City Hall. NORWALK, Conn. – Norwalk is planning a $6 million reduction in its fund balance, or “Rainy Day Fund,” as part of its 2019-20 operating budget. If approved, the result would be a decline in most homeowner tax bills, in spite of expenditures increasing 3.3 percent overall, and a 4.2 percent increase on the Board of Education side of the budget. Homeowners in two districts would see a tax increase: East Norwalk would rise 6 percent and South Norwalk would rise 1 percent, due to the property revaluation. “I believe that our grand list has increased by about 16 percent,” Rilling said at Monday’s Board of Estimate and Taxation meeting. An excerpt from the City of Norwalk proposed 2019-20 operating budget. Norwalk has “historically has been extremely conservative in putting revenue assumptions together,” Norwalk Public Schools Chief Financial Officer Thomas Hamilton said, explaining the growth of the fund balance (Rainy Day Fund) to $60 million. That’s “fine to a point but when you have a $60 million fund balance it really is no longer necessary to build, sort of, that level of conservative revenue assumptions into the city’s budget year after year after year,” Hamilton said. Hamilton, former Norwalk Finance Director, helped the City formulate its budget after the sudden resignation last month of Chief Financial Officer Bob Barron, working with Norwalk Director of Management and Budgets Angela Fogel. “It’s a very challenging time when your staff is all in place. It becomes even more challenging when you have personnel issues and so on,” Rilling noted. He thanked Norwalk Superintendent of Schools Steven Adamowski for allowing Hamilton to help out. Rilling said he’d asked City department heads to keep their budgets flat, with increases only mandated by contractual increases. “I think they have done a good job,” he said. Rilling endorsed the BoE’s efforts to enact its strategic operating plan, “that has shown tremendous results so far,” and mentioned that he’s looking forward to increasing the credits high school students must meet to graduate so that they can be even more competitive in today’s world. The total tax levy recommended is $331,965,622, a 3.3 percent increase from 2019-20. Education funding would increase $8 million; debt service is increasing $1.5 million, in accordance to the planned construction of new schools; the economic and community development department is increasing $1.3 million and the Norwalk Police Department expects a $1 million increase. Adamowski plans to implement a hiring freeze and pay current employees stipends to cover the work that’s needed, BoE member Bruce Kimmel said. “We would like to see what we can do to really control spending and see what kind of money we have at the end of the year,” Kimmel said. The increase in Economic and Community Development is partially due to the recent reorganization of City administration, which transferred some Department of Public Works employees there, thereby reducing DPW wages by $337,305. The current budget calls for a nearly $3 million use of the Rainy Day Fund, but it’s looking like that won’t be necessary, Hamilton said, because building permit revenue is already about $200,000 more than anticipated and “something big hit” with $1 million recorded in early February. The Fourth Taxing District, comprised of homes that are on the City’s sewer system, will see a median decrease in tax bills of $290, Hamilton said, during the meeting. A chart included in the presentation shows that a Third Taxing District median tax bill would increase by $390, and the Second Taxing District median would go up $51. It must be an election year 🙂 Creative accounting at its best. As for growth in the grand list – that will be appealed away. Here are some Norwalk fixed costs statistics: Under this mayor, NPS added 500 students to the rolls – a growth of 5%. The poverty rate, as measured by free and reduced lunches grew by 10% – from 47% in 2012-13 to 57% this year. For a little more perspective, when my children started school in the mid 2000’s, the poverty rate was 23%. Despite this administration’s development ‘growth’ and tax credits, we still can’t fund our school system without dipping into the Rainy Day fund. This administration has lost or given away millions and millions in taxpayer money due to poor management and bad land use decisions over the past five years. I hope folks are able to see through this charade, because this taxpayer does! Why not just make Oak Hills whole? It will cost far less than this $6million or the $13million for the BofEd. Roger, You raise a good point. I don’t necessarily have a problem using the Rainy Day fund to address a ‘one time’ capital’ budget issue – but using it for operating expenses to cushion the tax blow ‘or lower taxes’ during an election year is a joke. The BOE budget crisis will resume next year and as it has since my children started in 2004. Why is the mayor masking the BOE budget with the rainy day fund? This was never its intended purpose as even the mayor stated last year. Bob Barron was always against setting this precedent but now it’s par for the course in Norwalk where the school’s finance chief can gladly step into the finance director’s role despite the blatant conflict of interest. What an election year gimmick to say the least. I would hope voters see through this financial charade before the sticker shock is truly felt with next year’s property tax hike. Recall, last year was an off year election and taxpayers were slapped with a 4% hike. The city is accelerating its glide path trajectory towards a Bridgeport solution. When you tap “rainy day funds”, what happens when they are gone and it rains really hard? As the article states, the $2.3 million from the rainy day fund to be used for Norwalk Public Schools is being used for one time expenses, not for operating costs that will recur next year. In these strange days of politics, there appears to be little downside to telling – well, not the truth. For all the folks who would universally lambaste our current US president for his transgressions, one must wonder why they give the local guy a pass? Oh, I know, you can’t say “that” – you should say – he misspoke, or to borrow from Roger Clements – he “misremembered”. Well, what other commenter’s here have said – are typically challenged by the nameless posters – who demand “links” to back up the statements. So, follow this. Notice the comment by Lisa Brinton – this growth “will be appealed away.” Why does she say this? Does anyone remember this – from just a year ago? This is when our prior CFO Bob Barron had to explain why there was no growth. Because there were 30.3 million in losses by appeals (not including the court costs). Norwalk Power LLC sued Norwalk in 2014, appealing a Board of Assessment Appeals decision to uphold the valuation issued by Stewart and calling the valuation of equipment and the property “grossly excessive, disproportionate and unlawful. ”A judgement was rendered in April. Further – it went on to say there were some huge losses -read for yourself – including “18 six-figure losses listed”. Grossly excessive, disproportionate, and unlawful. Again, residential property increased by 10.7%, commercial by 32%. Question: Is Michael Stewart still the tax assessor? I’ve heard the definition of insanity is doing the same thing over and over and expecting different results. A corollary to that is – it is insane to believe a man who says two things – completely contradictory to one another – about the same topic. In politics – it is the dreaded “flip-flop”. 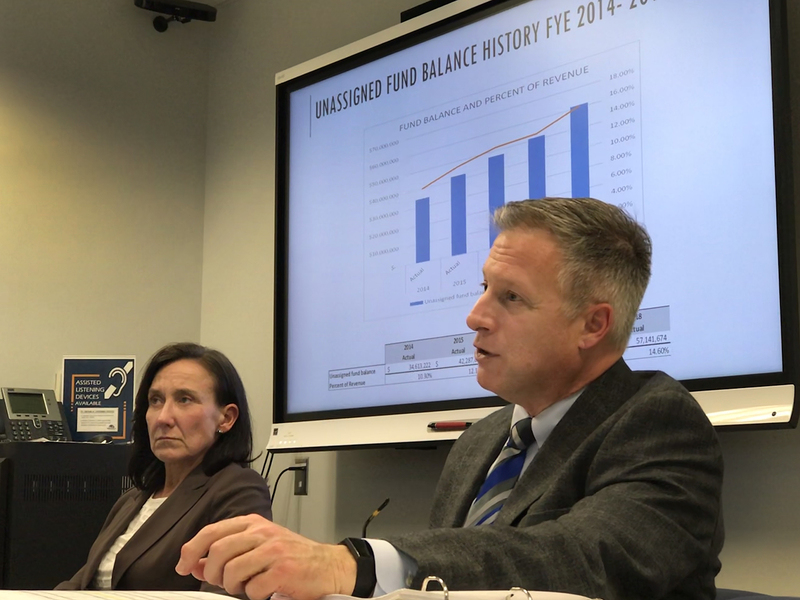 “A fund balance is something that cities need to have,” Rilling said. “Yes, we have healthy fund balance but that’s because we have been very responsible in our budgeting. We have been very responsible in putting money away so that we have it if we need it. It’s not a wise decision to draw down on the fund balance for an ongoing expenditure. Agreed – it is not a wise decision to draw down on an emergency fund for an ongoing expenditure. Do you think we could get him to explain – what changed? Other than an election year? To give them an out – as Ms. Meyer-Mitchell quickly re-directs, 2.3 million is for 1x costs. But the drawdown is 6 million, right? The grand list growth is an illusion. Property values have not increased – ask the relator who can’t sell your home. Another illusion? That out of control city hall spending won’t hit your checkbook. The whole city should misremember to pay our taxes. You get what you vote for. It must be Tuesday, Lisa Brinton is complaining again. Does this lady ever have anything positive to say? -Schools getting better with more investment and renovations (thanks BoE). -Streets getting repaved and safer (thanks DPW). -New sidewalks and crosswalks going in (although we can always use more, but again thanks to DPW for doing the best they can with existing resources). -Parks and ballfields getting better (thanks Park and Rec). -Walk Bridge replacement, along with replacement of other obsolete rail bridges in Norwalk on nation’s busiest rail line, moving forward with planned disruptions decreasing with good planning (Fort Point St. won’t be closed as once expected, and other detours being improved. Thanks DOT and DPW). -East Avenue south of 95 (including exit 16) becoming a much more attractive and safer Complete Street soon with street trees, historic lights, buried utilities, renovated train station, and better traffic flow for all users (thanks DOT, DPW, and Third Taxing District). -Ryan Park being rebuilt (thanks Redevelopment). -New school to be built in South Norwalk, Columbus school to be renovated, and Norwalk poised to be first district in state with K-12 International Baccalaureate (IB) Program (thanks BoE, Common Council, Mayor Rilling). -Libraries improving and expanding (thanks to the Library boards and staff). -Norwalk’s downtown and transit-oriented areas being redeveloped with new businesses and housing choices including more affordable housing for expanding population (thanks Redevelopment, private investors). I’m sure I can go on with this list of positive things about Norwalk, but let me just summarize and say Norwalk is a great place to live, work, play, and raise a family, and only getting better! Mr. Mushak’s promises with regard to East Avenue are premature. I will observe that the TTD has not rendered any decisions with regard to some of these items. Having a majority of Democrats on this body does not mean decisions will sail through. East Norwalk WILL however accept everyone’s thanks for taking up the brunt of the tax impact for the recent increases in the costs of city operations. It has yet to be determined whether they will willing to subsidize further improvements on top of the 20-30% tax assessment increases AND the Walk Bridge disruptions AND the impacts from increased density.